Does God Ever Change? What's the Bible Say? The book of Hebrews says that Jesus is the same yesterday, today, and forever (Hebrews 13:8). And since Jesus is God (John 1:1), doesn’t that mean the God never changes? That’s what I’ve been taught. That’s what this verse in Hebrews seems to say. Yet as I read my Bible the God in the Old Testament comes across as a God of judgement while the God in the New Testament is all about grace. We fear Old Testament God and love New Testament God. Perhaps fear and love are opposite sides of the same coin. Yes, we do see God’s love in the midst of Old Testament fear and have reason to fear God among his New Testament love, yet neither is the prevailing thought. But I see even more differences than just Old Testament versus New Testament archetypes of God. In the Garden of Eden God walks with Adam and Eve; they enjoy community with each other. Then Adam and Eve sin: banishment, judgement, separation; God is distant. The God of Abraham and Job seems hard to understand, yet emerges as patient despite his clear sovereignty. To Moses God shows relationship, power, and a grand plan. In the era of Judges God seems mostly uninvolved as his people flounder. After they demand a king, much to God’s dismay, he actually seems more present, more involved in the United Kingdom under the rules of Saul, David, and Solomon. Next is the time of the prophets: warnings, short-term repentance, and eventual judgement; God offers much patience before exacting his punishment. And if we read the Apocrypha we see God as involved but ethereal – compelling, yet a bit aloof. In the New Testament we see God as love through Jesus in the Gospels. Then we see God as power through the Holy Spirit in Acts through Revelations. Depending on which section of the Bible I’m reading, God seems different, like he’s evolving over time. Of course I like the New Testament manifestations better and see Holy Spirit power as the most relevant understanding of God for our world and the church today. Yet the Bible says God doesn’t change; he is the same. 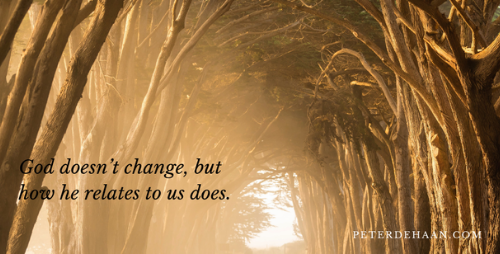 I think that’s right: God doesn’t change, but how he relates to us does.